On Wednesday night Patrick Jonhstone spoke about his recent missionary trip to North-East India. 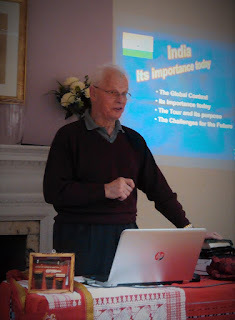 Providing a fascinating world-wide overview of missionary work in the current global climate as well as predicting future problem areas and opportunities for growth, Patrick gave encouragement to the church to engage in mission on a wider scale. He also spoke about his trip as well as some of the people he encountered there and what his visit achieved. There was time for us to sample some Indian food half way through the presentation. There was also opportunity to ask questions. Thank you to all who came and to Patrick for an enjoyable and educational evening.